OMG, we finally got to try the Impossible Burger, a meatless plant base burger patty that bleeds and tastes like a real thing. In Washington DC metro area it can now be found at our favorite burger place Counter in Reston Town Center. This is one of those cases when the meatless dish is not just for vegan or vegetarians, but also for us meat lovers. If you been reading our blog, you know we love our meat!!! This is by far one of the best burgers we’ve ever tried, it tastes even better than meat burgers. You heard us right, it tastes even better than a meat burger. It was like tasting a delicious juicy meatloaf. Feel free to skip right to our custom burger build review. 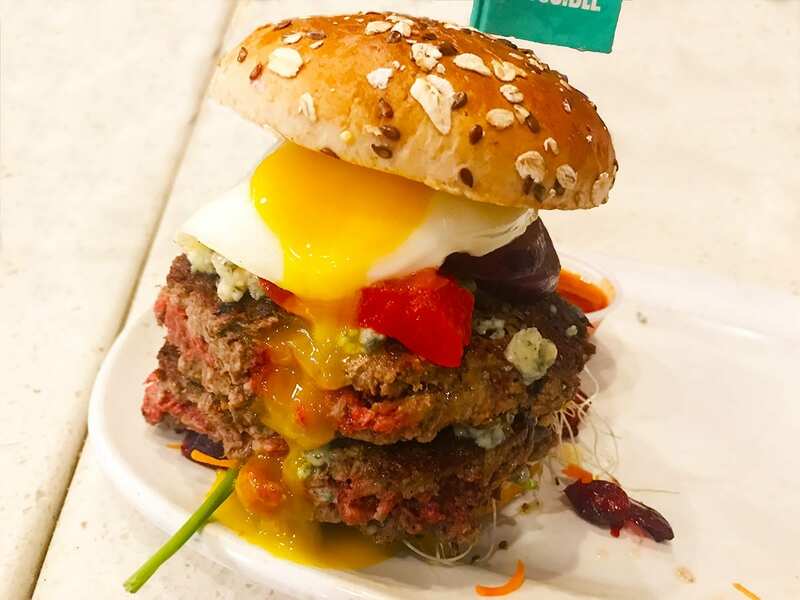 What is an impossible burger you ask? Well, this is a creation of science! 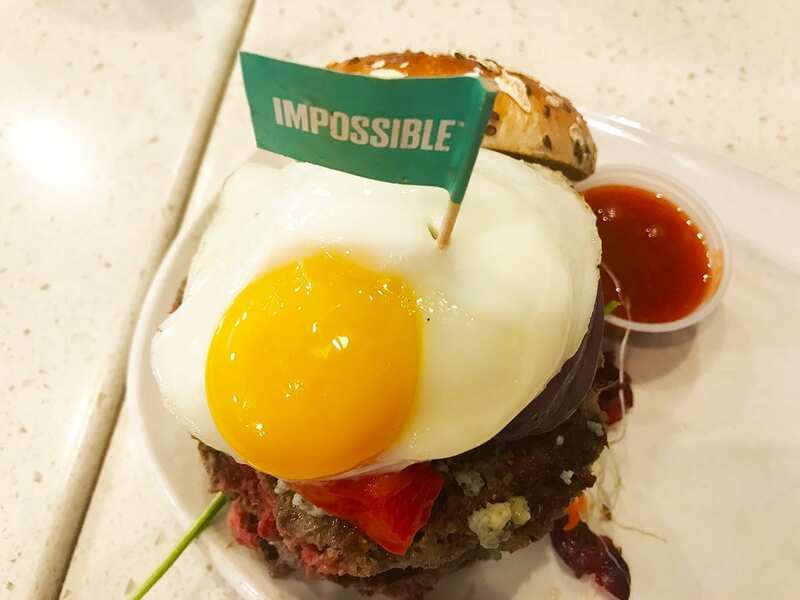 Smarty Pants foodies at Impossible Foods created a new meat replacement with all natural ingredients like wheat, coconut oil, and potatoes. They used a compound Heme that can be found in all livings things, even plans. Plus that what makes meat look red, taste meaty and bleed. Why they use word magic to describe it on the website, we call it for what it is SCIENCE! The burger is taking over the nation and you can find it served near your at these locations. How would you like your burger made, rare, medium, or? We were very surprised when they asked how we would like our Impossible Burger prepared. Yeap, here you can choose the heat of preparation like medium well or rare. While they do have a pre-built version, when you come to Counter you must create your own burger. We did accidentally end up with an extra patty because 1/2 size means double. We won’t complain about this awesome mistake! 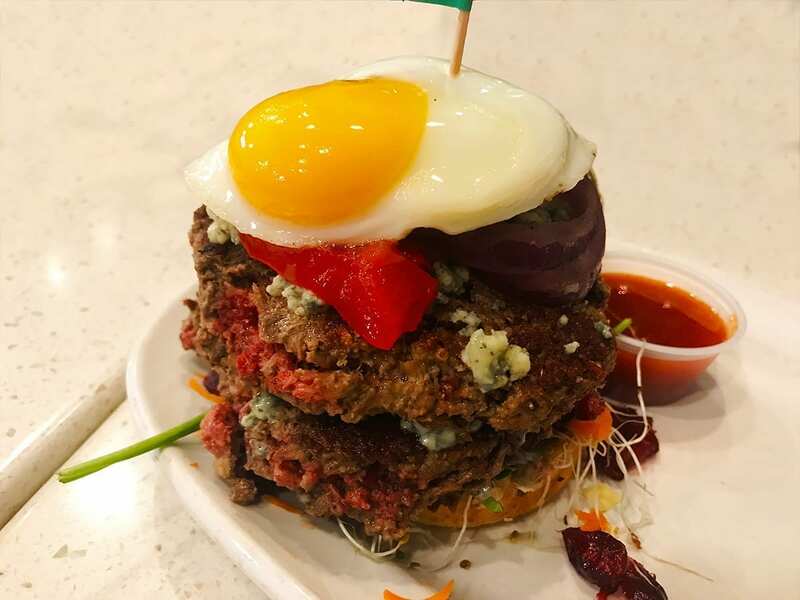 For our build, we went for Danish Blue Cheese to add that extra strong flavor, Spinach, Dried Cranberries, Carrot Strings, Alfalfa Sprouts, Grilled Red Onion, Roasted Red Peppers, Sunny Side Up Egg, and topped with Multigrain Bun. For our sauce, we went with Sweet Sriracha, but with so many different flavors and strong Impossible patty flavor, you don’t really need one. What really impressed us is how juicy and flavorful the “meat” patty was. Consistency and texture really were just like a real thing. It did have a might lighter feel to it and one of the few times we didn’t feel like dropping into a food coma right on the spot. 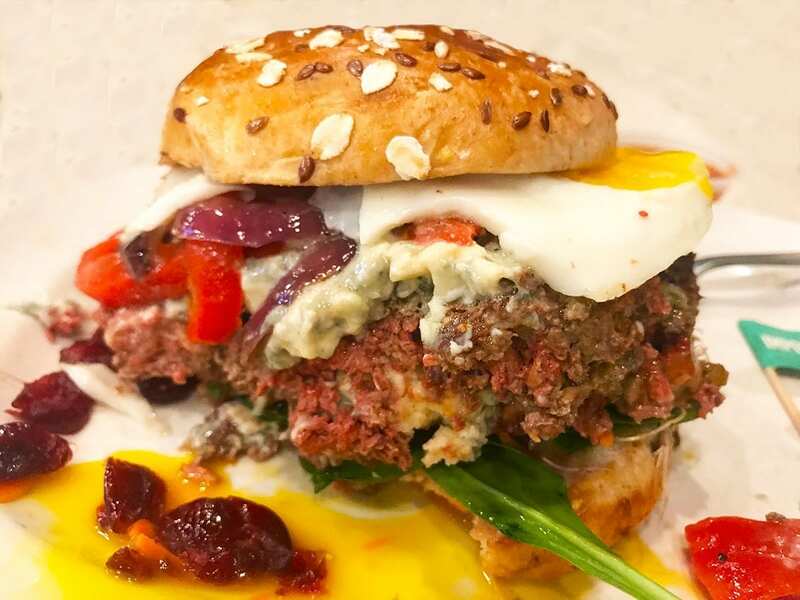 It was pure joy to try this brand new plant protean based burger patty. Plus its only 220 calories per patty or 440 in 1/2 size. So that’s a good excuse to eat more burgers. Price wise you will be making a slightly more expensive burger then normal. Base for 1/2 meat patty is about $14, plus an extra $5 for making it Impossible Burger patty. So yea an $18 burger WOWzy, but honestly its so worth it! They are not even paying us anything to say this, we just liked it that much. 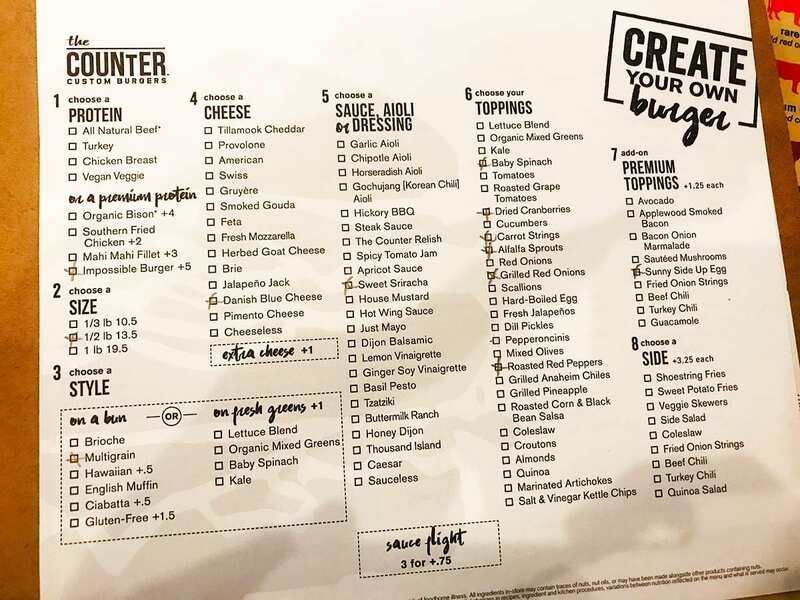 Of course, you can always not go for double patty then it would be just $15 not including any premium toppings like sunny side up egg. Even with a high price, this burger still owns high marks. Counter Newbie? Let’s fix it! If this is your first time hearing about this place, then you are in for a treat. This is one of the most magical burger places out there because you get to build your own. Put as many toppings as you want, pick the size, out of 14 kinds of cheese, and 23 sauces. There are a few extra premium toppings like sunny side up egg and bacon-onion marmalade that you pay extra. This is one place where extra fees are really worth it. Check out some of our other reviews from Counter.